He’s said to have died on 17 March AD 460, and pretty well ever since we’ve been celebrating, at least in Ireland. The St Patrick’s Day parade, though – that’s a relatively modern invention. It began in America, on 17 March 1762. Some Irish soldiers serving in the English military were given permission to march through New York City, the idea being that this would help them reconnect to their Irish roots and link up with fellow-Irishmen serving in the English army. It caught on, but it took a while for the St Patrick’s Day marches to draw public affection. During much of the nineteenth century, the Irish in the US were an oppressed minority, and when they held their Paddy’s Day parades in towns and cities throughout the country, local papers like to portray them in cartoons as drunken, violent monkeys. Contrast that with now, when American politicians jostle with each other to get a place in the parade. St Patrick himself came here from England. Some people insist he was really from Wales, just as some people get chest pains if you suggest St Patrick didn’t actually spend his six years of slavery on Slemish in Co Antrim, but did his sheep-herding in Killala in Co Mayo. The other thing about Patrick that makes me uneasy is his reluctance to actually live here. The first time he had to be brought to Ireland in chains. The second time, when he came back to preach, you got the impression that he did so only because the voices in his head – his conscience – insisted that he must. The truth is, we have as our national saint an Englishman whose teaching method verged on heresy, and who if left to himself would never have set foot in our country. 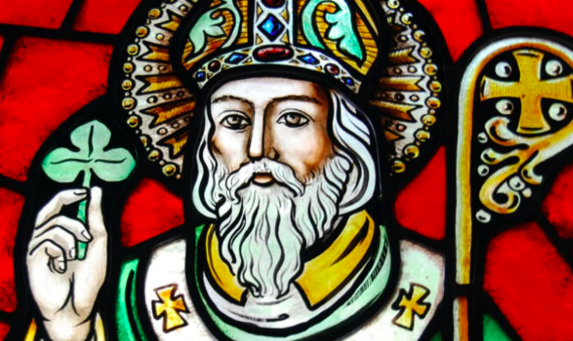 What’s amazing is, we forgave Patrick all that, embraced Christianity despite the shamrock, and we go on celebrating Patrick’s name centuries later. Sure there’s nobody like us. Have a whale of a day. Is it right or wrong to refer to Martin McGuinness’s ‘military service’?